Nobody wants their home to look like everyone else’s; your home should reflect your individual taste and needs. And if you’ve invested the time and money necessary to build a home theater, it should also be as unique as your home. While the process of setting up a home theater has certain common elements across the board, you shouldn’t be satisfied with a cookie-cutter design. Here are a few things you can do to help your North Island, BC home theater installation stand out from the pack. Lighting control is an excellent way to make your home theater more convenient to use as well as the aesthetic benefits it provides. Because lighting control systems use dimmers instead of simple on/off switches, you can control the ambiance in your home theater to a much finer degree. Maybe you want near-total darkness for your favorite slasher movie, or to make things a bit brighter if you’re watching a movie with your children. Lighting control gives you these options and many more, as well as letting you save time by creating and saving presets. The technology that drives speakers and home theater displays has advanced considerably in recent years, allowing consumers to get quality performance from more reasonably-sized devices. What this means for you, in terms of your home theater décor, is you can now get your speakers and TV off the floor, freeing up space as well as removing a potential visual eyesore. Your speakers can be mounted in your ceiling or walls, enabling you to create a surround-sound experience while simultaneously making your home theater more pleasing to look at. As for your TV, there are several ways to have it blend more seamlessly with your theater’s aesthetic. You can mount it behind a retractable wall panel, or you can buy specially made furniture that hides your TV until you’re ready to watch something. 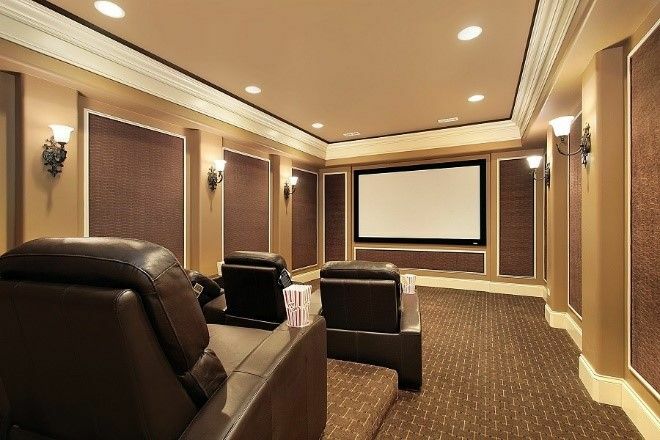 It’s no accident we use the term “home theater” to describe dedicated movie-watching spaces in our homes. Often the goal is to recreate the cinema experience, so why not lean into that idea and make your media space more theater-like. How? You can add retractable curtains to evoke the golden age of Hollywood and throw in some theater-style seats to complete the illusion. Another option is to install a popcorn machine, giving your room a better snack option than the microwaveable kind, a touch of personality, as well as giving you one less reason to need to leave the room. There are certainly ways to create a home theater that’s visually pleasing while following a familiar pattern, but as we said before, why would you want a cookie-cutter design? There’s no better way to make your theater own than picking out a theme reflecting your favorite flicks. An easy way to start is by hanging up some posters from your favorite movies. If you want something a little more elaborate, you can include some design elements reflecting your preferred movie genres. If you’re a big fan of Westerns, for instance, maybe you want hardwood floors and walls along with some horseshoes or other cowboy ephemera. Or maybe your tastes lean more toward science fiction, in which case you can create a field of stars in the ceiling with LED lights. Mix and match different styles and themes until you create something wholly your own. Hopefully we’ve given you some ideas on how you can make your home theater installation stand out among your North Island, BC neighbors. To learn more, call our office at 250-248-5382 or visit us online.